I took Acid-A-Cal by Enzymatic Therapy for calcium deposit in shoulder. Unfortunately it doesn't agree with my stomach. I think it might have help. 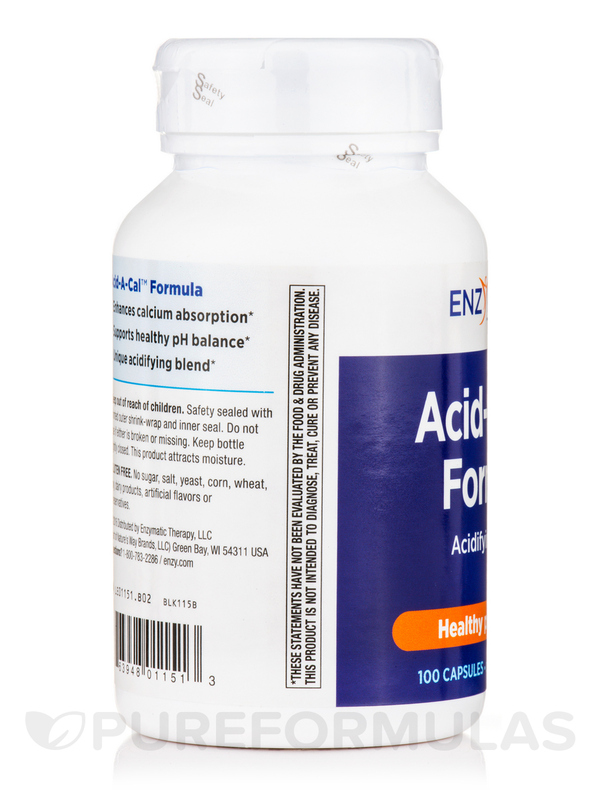 The body must maintain the proper acid-alkaline (pH) balance to function at optimal levels. 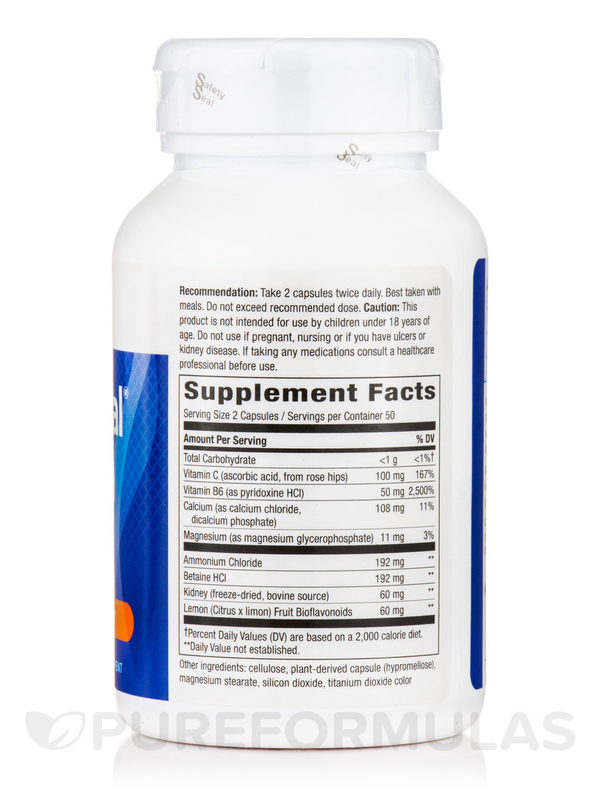 Supplemental acidifying compounds such as ammonium chloride‚ betaine hydrochloride‚ and calcium phosphate can help support balanced pH levels. 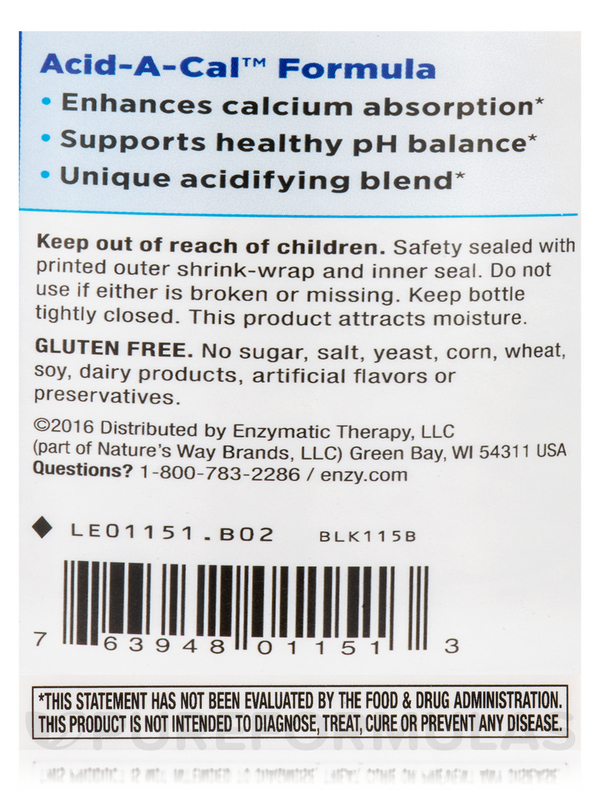 Other Ingredients: Cellulose‚ plant-derived capsule (hypromellose)‚ magnesium stearate‚ silicon dioxide‚ titanium dioxide color. Take 2 capsules twice daily. Best taken with meals. This product is not intended for use by children under 18 years of age. 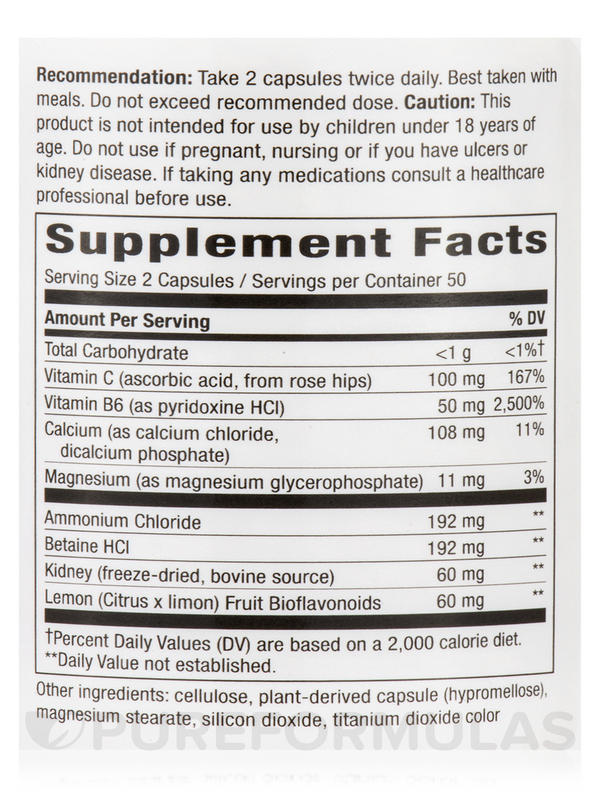 Do not use if pregnant‚ nursing or if you have ulcers or kidney disease. If taking any medications consult a healthcare professional before use. Notice: This product attracts moisture. 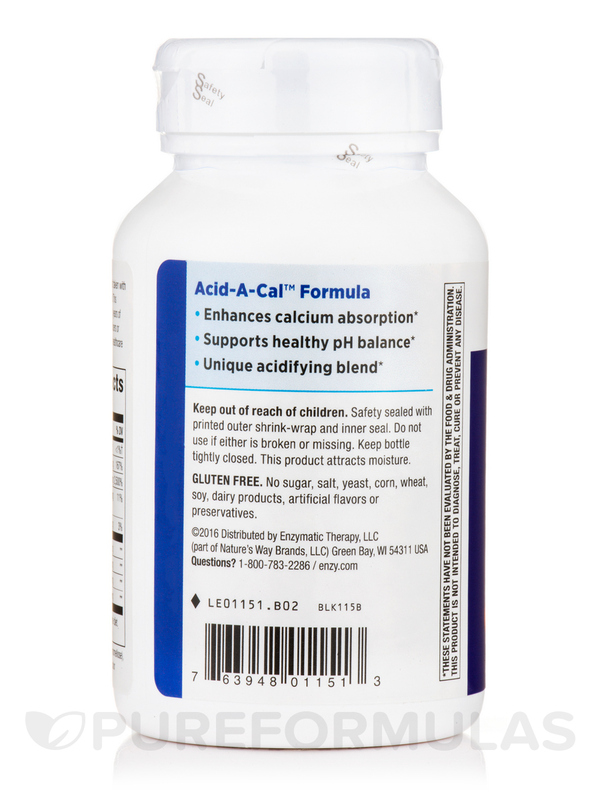 I am taking Acid-A-Cal Formula by Enzymatic Therapy for heal spurs, I was advised by a health adviser to take 3 to 4 capsules 3 times a day with meal. I was also advised to take K-2 once a day, it helps Acid A cal work better. The heal spurs were gone by 4th month. I learned that my calcium supplements made from coral or shell was causing my heal spurs. The only calcium we should be getting is from plants. If you really want to make your bones strong its not calcium that makes your bones strong , its the magnesium and bamboo silica or living silica that makes bones strong. Its not expensive and it WORKS!! I had heal spurs on both feet. I was advised by a health advisor to take 3 Acid-A-Cal by Enzymatic Therapy three times a day with meal (ignore the amount on the bottle) also to take Vit K-2 with this to work faster to dissolve calcium deposits and spurs. They promised me it would work and it did! You will feel the results within a month depending how bad it is. You only need Acid A Cal for short term. The ingredients but since its only needed for short term I can live with that. Not so easy to digest. I do not use Acid-A-Cal but Good Christian friend and co-worker is very satisfied with it. He is Hispanic in his 50s and works with me in a popular national-name store deli. He uses it to relieve effects of a bone spur in his foot. He firmly believes Acid-a-Cal actually reduces the spur in size because he can feel the reduction in local pain after taking it for several weeks. He doesnt use it except if the spur seems to return when he stops taking it for a while. I am ordering another bottle for the 3rd time over a period of about two years. He sees no bad effects from taking this product. 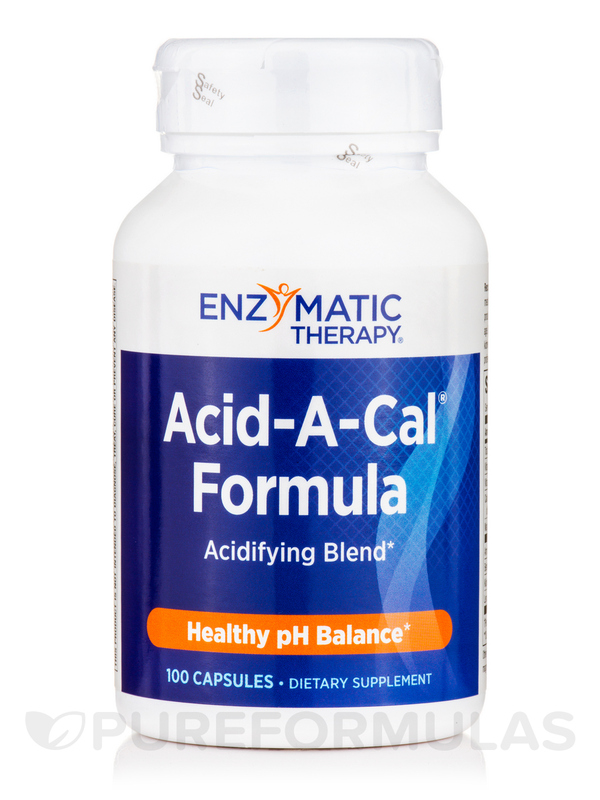 Took Acid-A-Cal by Enzymatic Therapy as suggested on the bottle.